News Update, 12-May-2016 Middlebury Gap road is being reconstructed over the summer of 2016. Work is underway. The road will be reconstructed from just before the summit on the west side over the gap and all the way down to Hancock, approx. 12 miles worth. Cyclists are being advised to avoid Middlebury Gap during construction, as there will be lengthy sections of gravel that may be difficult to ride with road bike tires. Rt 125 will not be closed, but there may be delays passing through. Periodic updates will be posted on a VT projects Facebook page. 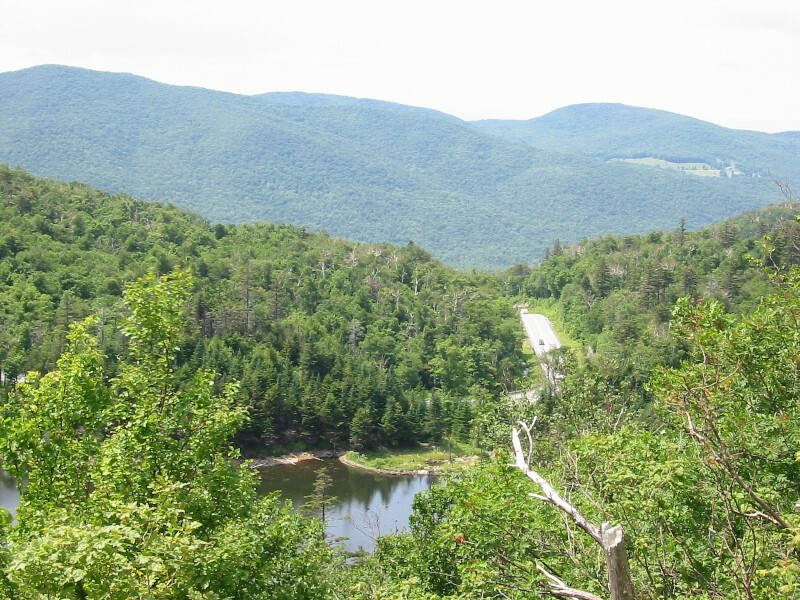 Nestled in the heart of the Green Mountains of Vermont is a cluster of mountain pass roads. The area lies just north of Rutland and Killington, and all but a few miles of this ride is paved. This ride continues to grow in popularity. Many groups and individuals set out to finish this ride each year. It is truly an epic ride, one that rivals the toughest one-day organized rides in the mountains out west. There’s great scenery out here, from open lush grazing valleys, rushing mountain streams, and vistas from several of the gap summits. * Per Garmin Edge GPS. Barometric altimeters typically measure 11,000 to 12,000 feet, but these tend to under-measure accumulated vertical in rolling terrain due to hysteresis built into measurement technique. Most mapping software applications tend to over-estimate the vertical of this ride. The true climbing of this ride may never be known. This ride will take a lot out of you. There are many country stores and gas stations on the main north-south corridors along the ride for re-fueling, so you will not need to take two gallons of fluids with you. There is at least one country store at the bottom of each gap. Plan on a full day on the road for the full 132 mile, 11,700 foot ride. Time in the saddle will depend on fitness level and how aggressively you tackle this ride. I've completed this ride many times, with as few as one other rider to over a dozen other riders. Ride moving times have varied from under 7.5hrs riding with an elite, competitive masters group to over 8.5hrs with a more diverse group. Less competitive groups may take 9-10 hours moving time to complete this ride. 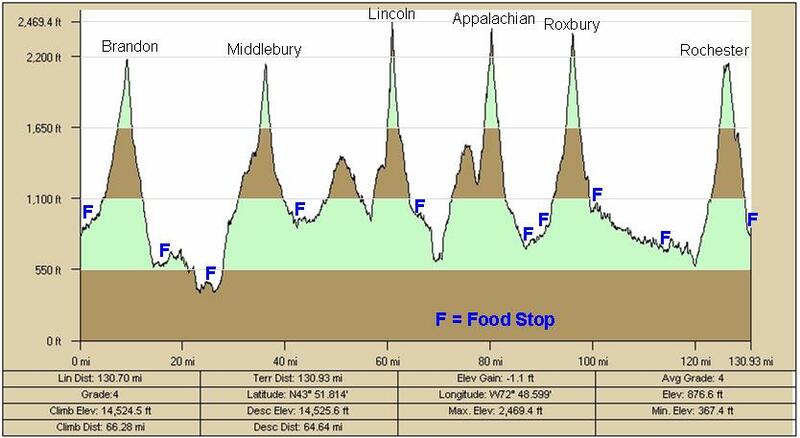 Add at least 1-2 hours to this for food stops and regrouping time at gap summits. Since 2003 when first riding six gaps, we started the ride at the junction of Rt 100 and Rt 73, tackling Brandon Gap first. This is the easiest of the six to climb. The descent towards Brandon is one of the fastest, usually breaking 50 mph. These speeds can be very dangerous on some of the other gaps. We next climb Middlebury gap from the west, starting from the lowest elevation of the ride. This climb gets a little more serious. Middlebury descends into Hancock with country stores at junction with Rt 100. After climbing a mini-gap through Granville Gulf heading north on Rt 100, we tackle Lincoln Gap from the east, the steepest approach. The climb starts paved, then gravel where it’s not very steep. But beware when the pavement starts again. It gets nasty steep, and stays that way all the way to the top. The top mile averages close to 20% grade, with some sections at 24%! I gear almost down to 1:1, and it still seems not enough. My cadence falls below 50 at 4 mph on this beast, pushing over 350W. The initial descent towards Lincoln is steep. In 2011, the upper paved portion was repaved. As the grade relaxes, the surface turns to gravel for a few miles of white knuckle descending. The gravel sections of the gap are usually meticulously groomed, so no problem for skinny 23mm tires. We next head over to “App Gap”, probably the second hardest to climb. This gap offers the nicest views from the top. The road stage of the Green Mountain Stage Race ends at the top of this gap, and you feel like you’re climbing Alpe d’Huez seeing race fan graffiti and km to go markers painted on the road. The long descent towards Waitsfield is a blast, but be wary of the sudden switchbacks. Cyclists have been hurt here. Rt 100 is taken south to Warren. As of July, 2012, this section of Rt 100 is in very poor condition. Cyclists are forced to take the lane in many places. From Warren, Roxbury Gap is attacked from the west. On paper, this climb should not be too difficult. But if you've already done Lincoln and App, Roxbury Gap will feel very challenging. Roxbury throw a persistent grade at you, and portions being gravel. Much of the vertical is lost on gravel descending the east side. The condition of the gravel on Roxbury Gap can be quite variable. If you hit it just after grading, it can be very soft and loose. A long dry speel with turn it into washboard bumps, which are very tough on the body and equipment if you let any speed run out. Sometimes it rides better than Vermont pavement. I've have hit speeds of 40+ mph in the past. We usually re-fuel at the Roxbury country store before heading 20 miles south on Rt 12A and Rt 12 to pick up Rochester Gap. This gap starts out quite tame, but gets steeper as you go along. With 120+ miles and 10,000 feet of climbing in your legs, you start thinking about throwing your bike over the guardrail. And yeah, that ridgeline you see way up there when you start, you DO have to go over that. But since the cars are in Rochester, it’s almost all downhill from there on back. In 2004, I used my PowerTap during the ride. I had some difficulties with it early on, losing the first 30 miles worth of data. But my best estimate of calories consumed during the ride was over 5,000. I believe I took in about half that from just prior to the ride to our last stop between Roxbury and Rochester gaps. The other half would have come from glycogen and fat reserves. I weigh about 165 lbs and carried a 8+ pound Camelbak. If your riding weight is more or less, you will burn proportionately more or less calories. Over half of the calories burned were used to overcome gravity during the climbs, even though this was a small percentage of the total miles. Virtually no calories are burned on the descents, since you are coasting for several miles. In 2006, another rider collected PowerTap data for the whole ride and produced almost 5,500kJ, or about 5,500 calories burnt. He also weighs about 165. Vermont 6 Gaps Road Ride 8/1/2009 from MountainPeakFitness.com on Vimeo. Photographer: Elizabeth Carrion. Rider: Joseph Azze. See the Mountain Peak Fitness blog for ride details. A quantitative analysis of the 6-gaps ride is now presented for those into numbers. 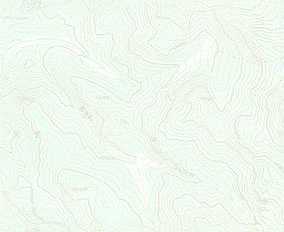 Profiles are generated by DeLorme’s Topo 6.0. As mentioned in the disclaimer footnote above, Topo is not always accurate in steeply varying terrain. It can over estimate elevation gain. I’ve also recently learned that barometric altimeters often do not give full account of elevation gained. They are programmed to ignore small variations in elevation, as a barometric altimeter cannot tell differences between wind noise and pressure change due to true elevation gain. Thus these devices, such as found in Garmin GPSs, under estimate elevation gain. This ride was originally noted as having 11,100 feet of climbing per a Suunto HRM. Subsequent altimeter measurements have ranged from 11,160 to over 12,000 feet. I believe these to be low today. My tool for generating plots is Topo. It estimates high in most cases, but I will use its results for consistency in presentation of data. The actual total climbing gain likely lies in between 12,000 and 14,500 feet. A shaded relief overview of the route is shown below. The view is looking roughly south, and I-89 is just visible on the upper left edge of the image. The Rt 100 valley is visible diagonally through the center of the image with steep mountain ridges to either side. It is these ridgelines that are traversed six times, comprising the six gaps of this ride. App Gap with the Rt 17 marker is in the foreground with Lincoln Gap just beyond the high peaks centered in the image. Google Earth was used to create the image with 1.5x vertical exaggeration. Most times I've completed this ride, it began in Rochester. There are two places to start from. There is a small dirt pull-off at the junction of Rt 100 and Rt 73. A benefit starting here is you can dip in the stream after the ride. The other place we start from, when school is not in session, is the public school on Rt 100 just south of the village center. An advantage starting here is there is often a porta-john behind the school, and there is much more parking space if you have a large group. This ride can be ridden in either direction and started at many points along the route. Another group I know starts in Warren and climbs the steep side of Lincoln Gap at the crack of dawn first! Talk about a rude awakening. We don’t have any compelling reasons to start just south of Rochester center, other than we’re not using business parking space and climbing Brandon Gap from here is the easiest of the climbs. Starting on Rt 100 also allows nice bailout options if doing only two or four gaps. The next image shows the total ride profile and distance. Odometers usually come out around 132 miles, which is within 1% of what Topo gives for distance. 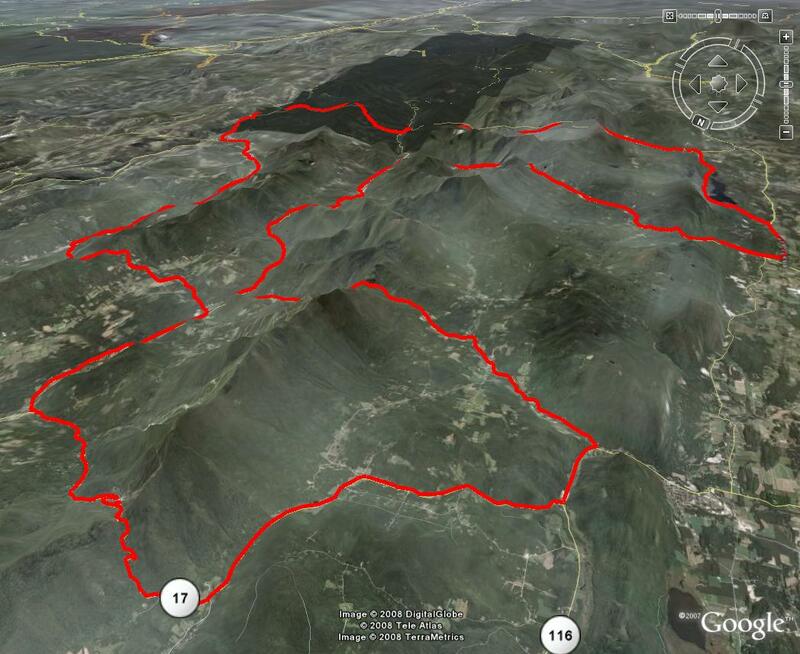 Because of the distance involved, Topo greatly exaggerates the steepness of the climbs in the plot. Each of these climbs will be presented individually with details. Brandon Gap bridges the towns of Rochester and Brandon. From the profile below, you can see that it climbs much more gently than it descends, at least in this direction. The first portion of the descent is very fast, most riders exceeding 50 mph if they have the skill and cajones for that kind of speed. But beware of the chicane part way down. If you over ran one of those turns, they’d be scraping what’s left of you off Green Mountain ledge (ledge is granite bedrock for non New Englanders). Once you get near the bottom, a right on Rt 53 takes you around Lake Dunmore on a pleasantly flat route on the way to Middlebury Gap. Middlebury Gap bridges the towns of Middlebury and Hancock via Rt 125. The climb starts out nasty steep, then lets up for a while before a moderately steep finish. This is one of the bigger net-gainers on the ride, gaining nearly 1800 feet. Road starts out a bit cracked up, but the descent is in pretty good shape. This gap is used in the Green Mountain Stage Race (GMSR), except it is ridden in the opposite direction. When you get back down to Rt 100, you are only about 4 miles from the cars. This is a good point to cut the ride short for anybody that thought the ride was pretty tough already, because you haven’t seen anything yet! Stop at one of the stores in Hancock to rehydrate and refuel. You will need it before attacking Lincoln Gap. Ok, this isn’t one of the gaps, but it is a respectable little climb between Middlebury and Lincoln Gaps heading north on Rt 100. Scenic, shaded, streams, and even a decent waterfall if it has rained recently. Moose have been sighted in this area too. This climb is not very steep, and you don’t realize how much vertical you’ve gained until you begin the decent to Lincoln Gap. The profile shown below is quite noisy, and some of those spikes may not be real. Also note that the scale changes on each of these plots, so this one shows only about 500ft of net gain. If you’ve ever been to the Lincoln Memorial in Washington, Abe’s memorial dominates you the same way Lincoln Gap will. The approach our traditional route climbs is from the east, or Warren side, descending to the west, or Lincoln side. You will encounter gravel on both sides of the gap. From Rt 100, the initial pitch is steep up Lincoln Gap Rd. As it tapers off, pavement will turn to gravel, riding almost flat or even some down hill. But once the gravel turns back to pavement, you are in for the mother of all grinds. The road is very narrow, just over one lane wide, and nicely paved. Keep your head up for oncoming cyclists (they are very quiet) and cars. The road is cut into the side of the mountain and rises at a fairly persistent 20% grade, some areas exceeding 24%. As it hugs the nooks and crannies, you keep thinking each time you pop out that you’ll see the top. No such luck. Unless you geared your bike very low, like near 1:1, you will cry on this pitch. I’ve seen strong riders give up and walk before reaching the top, cussing along the way. You will also wheelie over if you don’t move forward on the bike. At the top, you once again cross the Long Trail. Further south, Long Trail runs into the Appalachian Trail. This is also the highest point of the ride, so it’s all downhill from here, right? The descent to Lincoln can be unpleasant, probably the least pleasant descents on the six gaps ride. It starts out as rough, choppy, frost heaved pavement that soon gives way to gravel. The gravel typically has been more pleasant to descend than the bumpy paved part. It is gravel for several miles, most of the way into Lincoln, but at a moderate pitch. The initial descent is very steep, and due to sharp turns and rough pavement, heavy breaking may be required. Those who go heavy on the brakes must let their brakes cool every couple minutes or risk wheel failure (broken spokes) or tire failure (melted rim tape, clincher blow off rim). Don’t compare the relative steepness of the plots presented here. The vertical and horizontal scales are different. Lincoln gap is way steeper than the others. Once in Lincoln, stop at the general store to recharge. Don’t get too comfortable though, you are only half way! 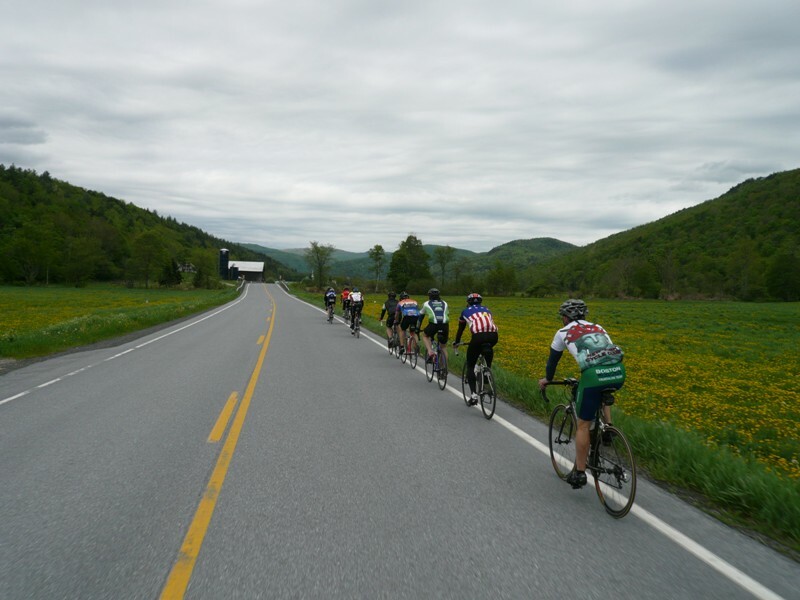 Appalachian Gap will humble most riders. It’s doesn’t have quite the punishing grade of Lincoln Gap, but it comes later in the ride, and the last kilometer or so is about 18% grade. The road race stage of the GMSR climbs App Gap from this side and finishes at the summit. No field sprints here. App Gap begins gradually enough, and there’s even a 100m descent on the way. This first bump is often referred to as “Baby App.” But once you start going up again, the switchbacks get tighter and the grade stays steep. This gap gets considerably more traffic than the other gaps. It seems motor cyclists, particularly those on crotch rockets, love this road. I wonder how many die each year on it, as fast as they rip through the turns. The view from the top of App Gap is perhaps the best of the gaps. A cliff overlook gives you views of the road and a pond way below, the Lake Champlain valley, and the Adirondack mountains if it’s not too hazy. Enjoy the descent. But due to ski areas part way down (popular summer resort too), watch out for touristy traffic. There are also a couple surprise switchbacks that always seem to catch us carrying way too much speed. The guardrails would make minced meat out of us loosing it at 50+ mph. Once you get all the way down to Waitsfield, there are several options for food and water. There’s a gas/convenience mart right at the junction with Rt 100. There are restaurants on Rt 100 both to the left and on the way towards Warren. We’ve stopped at the Easy Street Café just south of Waitsfield a couple of times for something a bit more substantial than cookies and sport drink. After some decent food, Roxbury is next. A couple tricky turns to make here. Heading south on Rt 100 into Warren, bear left on Main St. Bear left again on Brook Rd. Climbing, you will follow a brook on the right for a while. You’ll pass Dump Rd on the left. Some riders have taken this as an alternative way to Roxbury Gap. Follow Brook Rd until it turns left. About a half mile or so, you’ll come to a four way intersection. Turn right. This will be Roxbury Mtn Rd. It very shortly will begin climbing steeply and turn to gravel. There are some intermittent paved parts on the way up, but lots of gravel. There will be some nice glimpses across the Rt 100 valley of the range containing the first four gaps you did. Be sure to look over your left shoulder once in while on the climb. The summit of Roxbury Gap is gravel, as is a good portion of the descent. 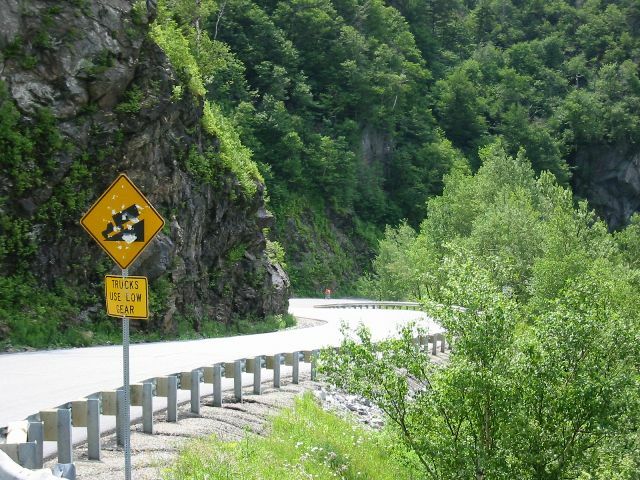 There are some sharp switchbacks which may have washboard bumps going into them, so watch your speed. I’ve hit 40 mph on this descent with 23mm tires, but I’ve also almost gone into the woods on one of the switchbacks too. When you pop out in Roxbury to head south on Rt 12a, there will be another country store right there. Five down and only one to go! Note from the profile below that you’ll have about 20 miles of near flat road before the turnoff to Rochester Gap. It’s slight downhill, and you can usually carry good speed on this section unless the wind is blowing. The town of Randolph will be en route, and you will need to bear right on Rt 12 in Randolph. You will then need to keep an eye out for Camp Brook Road to the right, as it is the road over Rochester Gap. It is about 5 miles out of Randolph. If you’re like me, you’ve been running on fumes in the tank for the last 20 miles and now it’s time to tackle the last gap. This one starts innocuous enough, climbing a gentle grade the first four miles. But you keep getting glimpses of a ridgeline that looms way up above, and you think to yourself you sure hope you don’t have to go over that. Well, you do. After about four miles of gentle climbing, the grade turns seriously steep for a couple miles before leveling off at the top, gaining about 1000ft in two miles. This gap doesn’t have as crisp of a top. It kind of wraps around a mountain peak, offering some great open views to the south. One year a thunderstorm moved through the area and we caught a glimpse of a rainbow from up top. The descent is quite good, with one small climb half way down. Let out a whoop when you get to the bottom, you just conquered The Six Gaps!